We had a great visit with our friends in Truckee, and enjoyed a delicious fresh dinner in their home followed by a late evening jaunt downtown for Straus soft-serve with olive oil and sea salt at a local eatery. Basically, heaven. As usual, the alarm went off far too early the next morning and our town stop was over just like that. Day 73 was different than any others so far because Bryan would join us for the short stretch from I-80 to Hwy 50, the only friend who has joined us hiking for part of the trail. We waved goodbye to Becky and their young daughter Annika and headed out from the trailhead with Bryan and his friend Matt, who planned to day hike with us to Squaw Valley then head home from there. As is often the case, we could hear the road noise from I-80 and see the highway for a few trail miles though we were surrounded by granite and conifers with good views of the surrounding prominences. 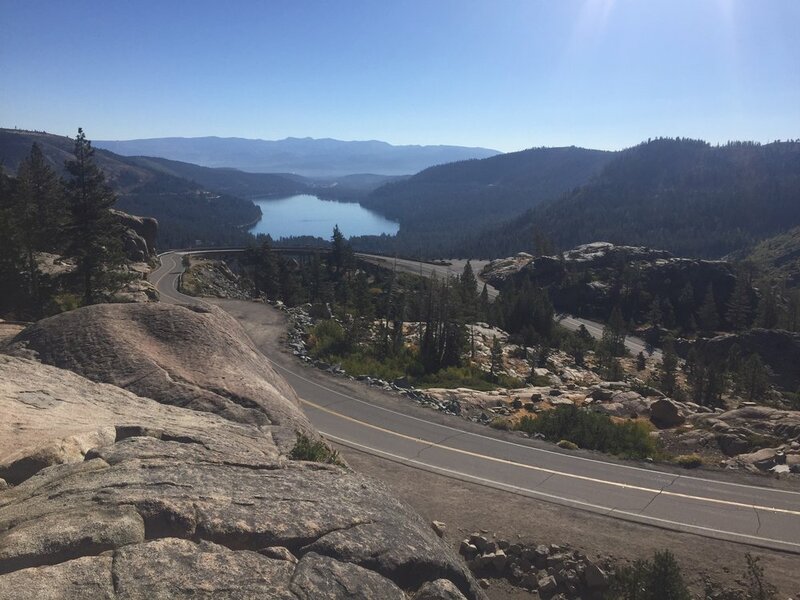 We saw the graceful and historic Rainbow Bridge on Hwy 40, and soon crossed this little-used road at Old Donner Summit near a boarded-up ski school that is currently for sale. Finally, 4 miles from the trailhead, we left the trappings of civilization behind and started our climb towards the shoulder of Mt. Lincoln, passing beneath Mt. Judah on the way. Matt works ski patrol for one of the local resorts and shared his knowledge about the visible peaks and ridges, and it was fun to catch up with Bryan. We came up behind a few large groups of students near Mt. Judah, apparently from an expeditionary school that focuses on learning through outdoor experience. Until we found a spot to pass them we listened in to the story of life in the time of covered wagons as told by the instructor, and Macro cracked up when we heard "the richer you were, the more pimped out your wagon could be." Beyond Mt. Judah, the trail stays high on the ridgeline and we walked through miles of dried mule ears punctuated by rare trees, generally Sugar or Jeffrey pines. Each of the peaks along our ridge had its own dark rocky outcroppings which contrasted well with the clear, blue sky and we could see Anderson Peak, Tinker Knob, and Billy's Peak stretch out in front of us for a preview of what the first half of our day would hold. We sat down for a break at a small saddle between Anderson Pass and Tinker Knob and were surprised to see what looked like a SOBO thru-hiker coming up the trail. It turned out to be Cookie, whose parents had given us apples at Hwy 36 about a week ago while we were waiting for my own mom. She hiked from the border to Hwy 36 last year, and this year will complete her SOBO hike by going from there to Campo. This was our first time meeting her, and we chatted briefly before she continued on. Those black rocks and deep blue sky! The weather was clear and warm, but not too hot and we had a nice breeze high on the ridges. We made decent time considering the higher elevations and our new company, and had a great time hearing of Matt and Bryan's recent adventures and sharing insights on our hike so far. Before we knew it, we had reached the junction to the trail leading to Squaw Valley and said goodbye to Matt. Not long after leaving him we started our climb up the shoulder of Granite Chief, which had been getting closer all day. The terrain became classic Sierra, with white granite and a forest of Mountain hemlock and Western white pine mixed with a few Red fir, and we saw patches of heather for the first time in weeks. We passed Cookie having a break in the shade and wondered if we might end up camping together tonight. The climb became steeper as we neared the top, and we passed under the top of a Squaw Valley ski lift just before reaching the saddle and the boundary for the Granite Chief Wilderness at 8500', the highest elevation we have been at so far on the PCT. It was a sweet reminder that we are getting ever nearer to the heart of the Sierra Nevada range and the high country that we love so much. Our target for the night was the creek draining the Five Lakes Basin, and to reach it we dropped down into an open grassy valley crossing the historic Western States Trail before following the Whiskey Creek drainage for a bit. We had some afternoon clouds for interest and good views back to Needle Peak and up to Squaw Peak. When Bryan joked that he might not be able to keep up with us, we reminded him that we were barely making 20 miles today and he seemed to be doing just fine so far. He hoped aloud that we didn't consider today's hike a Nero day (as we did yesterday's 9.9 miles into Truckee) and we reassured him that it was well beyond Nero and into Wilderness Leisure Day classification at least. In all seriousness, it was fun to hike with such a fit non-thru-hiking friend. We reached our campsite at the creek before 5:30, and were passed by Cookie not long after that. She planned to push on a bit further, with an eye towards her next resupply in Markleeville. We enjoyed the luxury of campsite daylight before hitting our sleeping bags for the earliest night ever in anticipation of a longer and harder day tomorrow. We went to sleep by the light of a full moon, and Macro pointed out that it is our second-to-last of this hike. Fun Fact: Matt is a medic officer on a rescue helicopter, and had lots of cool experiences to share. 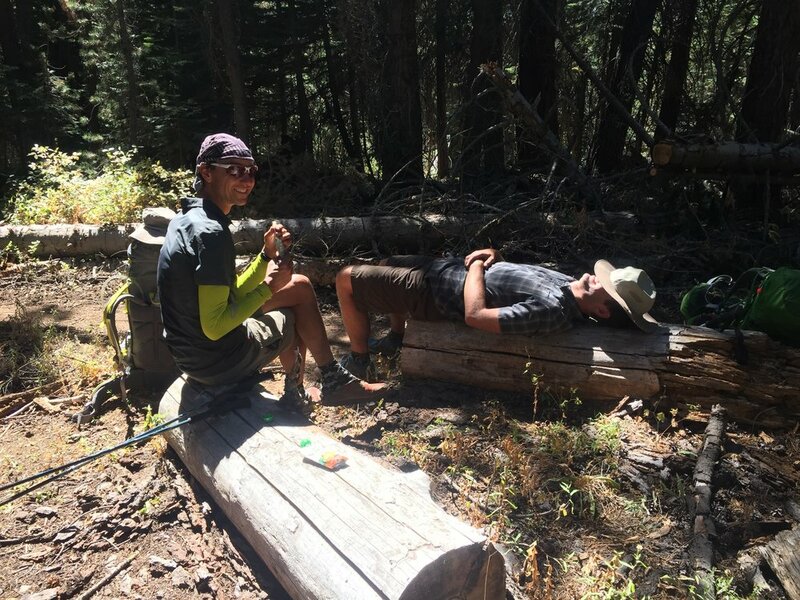 How many PCT hikers do they rescue in the course of a usual season? At least one a week! We do not intend to require his services, but it's good to know he's around just in case. What a coincidence that we crossed paths with Annette! Day 74 dawned cold, and we all started in multiple layers. Bryan half-joked (I hope) that he had gone to bed last night fully intending to tell us this morning that he was headed back to the trailhead and would bring our resupply to Echo Lake by car. In true thru-hiker style, he recovered overnight and was now ready to hit the trail with us for what would be his longest-ever single day's hike of 27+ miles (with ~4300' of climbing) if we made our intended A-goal of Fontanillis Lake. We also had a few options several miles short of this goal, but of course those miles would have to be hiked at some point. Fontanillis Lake is both beautiful and holds special meaning to Macro and I so we were hoping that the universe meant for us to camp there tonight. We hit the trail right at dawn and started climbing immediately, with pink morning light on the opposite slope and the full moon setting just above it. It was pretty spectacular, and clearly much better than a backtracking hike north to the freeway noise of I-80. 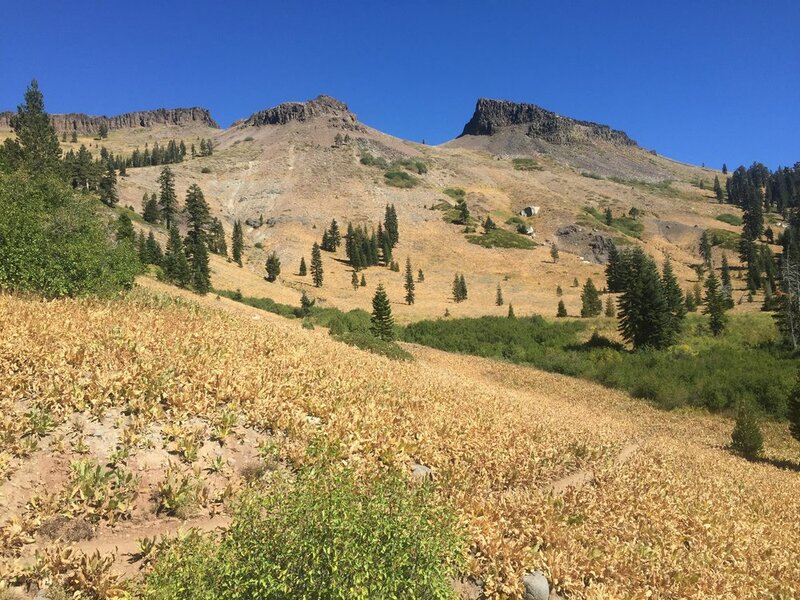 We climbed to nearly 8500' again, and skirted the wilderness boundary at the top of the Alpine Meadows ski area near Ward Peak. 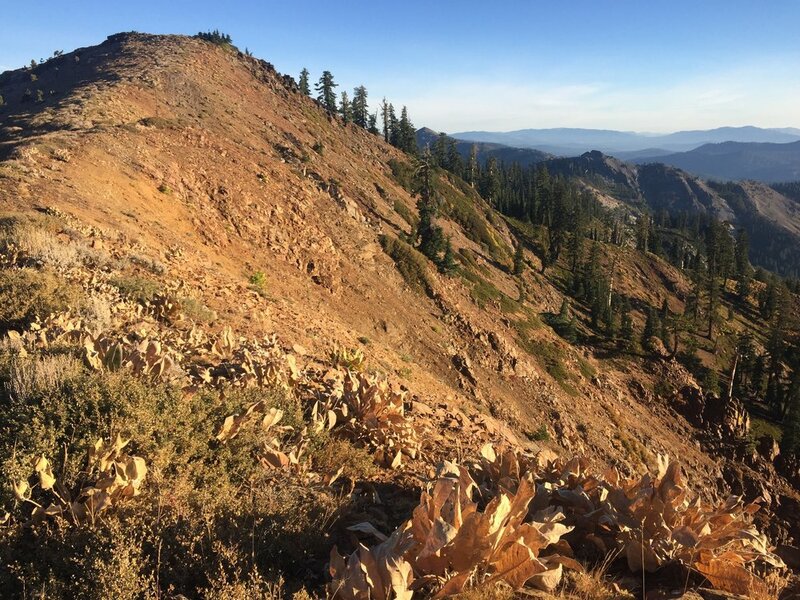 Bryan has skied the local resorts extensively and knew the terrain around each well, though heading south on the PCT from here would be new territory for him. The first half of the day held more high ridgeline walking through alternating slopes of golden dried mule ears and dramatic dark rock. 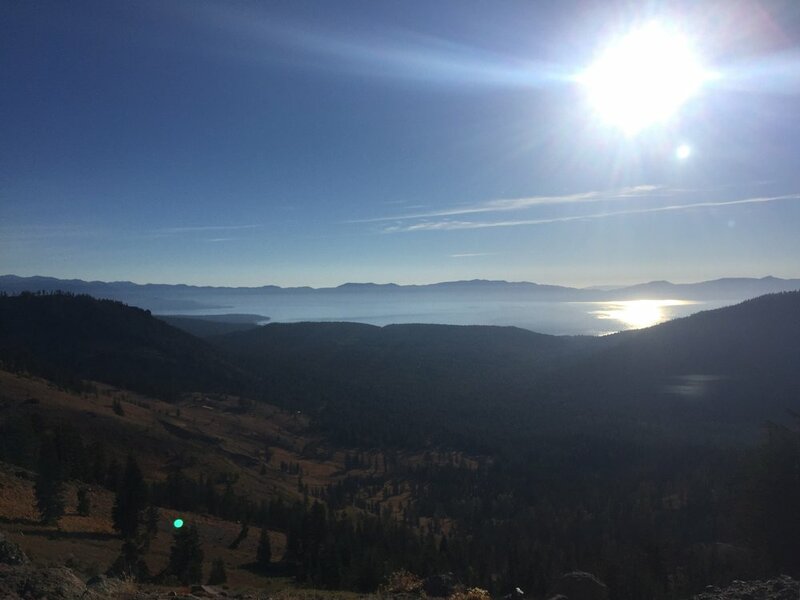 We had stellar views of Lake Tahoe to the east and could see all of the peaks from whence we came looking north, including Castle Peak whose pass we went over before reaching I-80 and Truckee on Day 72. By noon the day was plenty hot and we were happy to reach stretches of shady forested slopes populated primarily with Red fir. 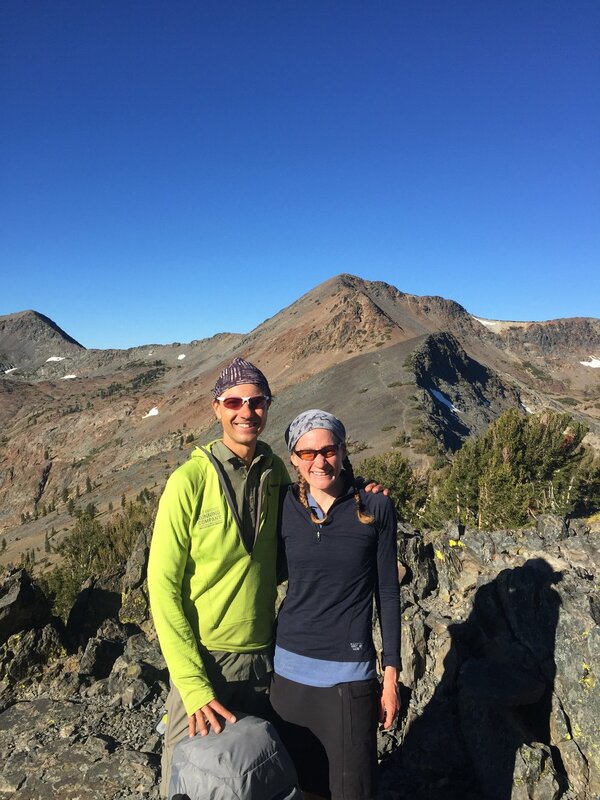 After a series of steep switchbacks to a high saddle with long views in every direction and access to nearby Barker Peak, we made the easy descent to Barker Pass. As we neared the trailhead parking lot we saw a large group of people with gear and bear canisters laid out on tarps, picnic tables set up with lunch, and folding chairs all around. It looked like a huge group, and we were just determining how to get around them and find the trail on the far side of the parking lot when I saw somebody who looked familiar on the tarp. She called out my name and I realized that it was a friend of my parents from my hometown! Annette was on Day 6 of a guided thru-hike of the Tahoe Rim Trail, and my mom had told her that I was currently thru-hiking the PCT. The odds are low, but we crossed the same trailhead on the same day at the same time. After marveling at this coincidence and catching up a little, she introduced me to some other participants and staff, and they invited us all to join them for lunch. As thru-hikers never turn down food, we eagerly accepted. As we sat eating our sandwiches, fresh fruit, chips, and yogurt we told Bryan he was getting the real thru-hiker experience, trail magic and all. Thank you Tahoe Rim Trail organization for your generosity. Leaving Barker Pass headed south we lost our high ridgeline views but dropped into very pretty forest. The first few miles of trail crossed several jeep roads, and there was some vehicle traffic to remind us that we are still near a population center. We ran into a trail runner, who asked if we were thru-hikers then told us he had just left Cookie at Richardson Lake about 45 minutes ago and she said he'd probably be passing us. We figured we were about 2 hours behind her, and wondered if we would see her today. We reached large but otherwise non-descript Richardson Lake early in the afternoon and all agreed that it was far too early to camp and we would press on to Fontanillis. We entered the Desolation Wilderness so no more roads, but otherwise the next several miles were very similar to the terrain just beyond Barker. We did catch a glimpse of Rouckbound Lake far below us to the west, and had a sense that there were peaks above us to the east, but with the thick forest we didn't have many views. We found both Phipps Creek and a nearby seasonal stream to be bone-dry, and while we stopped at the latter for a late afternoon break we were glad we didn't need water. We realized that if we continued to make good time we would reach Fontanillis by daylight, perhaps even in time for a swim, so we kept the break short. Bryan insisted he was tired but good for the target goal, and we headed up the trail. Middle Velma Lake is just a mile short of Fontanillis, and as we passed it there was perfect golden hour light on the rounded granite slabs across this large and picturesque alpine lake. There are many great campsites nestled in the trees all along the shore and it was tempting to stop and call Plan B good enough, but we made the final 350' climb up to the higher Fontanillis Lake and in fact reached it just as the sun was dipping below the granite slabs on the far side of the lake. The outlet was still flowing, a perfect place to get water for dinner, and I found a perfect campsite on a flat bed of decomposed granite above the trail and lake with a small Western white pine for protection and great views of the sky. From the rocks just above our campsite we had great sunset views of Lake Tahoe in the distance, and Upper Velma Lake below us. I even stripped down and had a quick and refreshing swim, despite the impending dusk and the lingering snow patches on the slopes across the lake. It was only the second time this trip I have been for a full swim and I have to admit that while cold and brief, it was glorious. Fontanillis holds a special place in our hearts because we took several backpacking trips to Desolation Wilderness with our dog Sula when she was younger. One of our favorite places to camp with her was on the granite slabs of Upper Velma Lake. From there, we would hike cross-country up to Fontanillis Lake where she would wade into the shallow waters near shore to play while we enjoyed the granite scenery. On one particularly hot day we turned around and didn't see her in the lake, and worried that she might have wandered off. After a short search we found her curled up into the tiniest ball possible for a Great Dane, wedged between rocks into the tiny patch of shade provided by a 3' tall tree in the high Sierra sun. We all hung out for a bit to cool off and rejuvenate before heading back down the trail to our campsite, but after that trip Fontanillis Lake will always remind us of Sula. We have already left some of her ashes at an idyllic meadow in the Trinity Alps, and planned to leave the other part of what we have been carrying somewhere in Desolation Wilderness as we spent so many happy days here with her. It was an easy decision for us to choose Fontanillis Lake as that place, and after we set up our campsite we walked along the lakeshore to find a perfect spot, one with easy entry to the water and nice mature trees so she could have all of the shade that a Great Dane might want. We were both emotional as we let her ashes go on the breeze, and wished her spirit peace in this most magical of settings. Between her creek and meadow in the Trinities, and her shady spot by a granite-ringed alpine lake here in the Sierra, she's going to be one lucky puppy in whatever lies beyond for well-loved dogs. As we cooked dinner and ate by headlamp, supplemented by the light of the rising full moon, we all agreed that this had been a pretty great day. Bryan proclaimed to be exhausted, but we were pretty impressed and told him that this had been a completely legitimate day of hiking, even by thru-hiker standards. In just over 12 hours we made it 27.4 miles with elevation, exposure, and a decent amount of climbing to boot. He insisted that we were just trying to make him feel better but in reality, it was 8 days before we ever hiked longer than 20 miles and 28 days before we first hiked longer than 27. Here he was, with 21+ on his first day out followed by a good long hike today. In comparison, the guided group we met at Barker Pass had only hiked from Richardson Lake this morning. The main reason that thru-hikers rarely have friends or family join them for portions of the hike is that we tend to cover many miles a day and it is difficult to find someone who can hit the trail running, so to speak. Bryan has not only added super fun energy to this last section, but has been able to hold his own in a tough crowd (us) and we're really glad he's along for these few days. He found a reclining slab of granite with perfect lumbar support and we sat on our bear canisters as we wrapped up our respective meals by sharing a dessert of dark chocolate (thanks to Macro's sis!) before making final nighttime preparations. Fontanillis Lake at ~8300' marks our highest campsite of the entire hike so far, and we were all happy to sleep surrounded by granite and stars. We got to sleep a little later on Day 75 since we had made our goal of Fontanillis the night before. We woke up at dawn and ate breakfast by early sunlight, surprised to find our elevated campsite warmer than last night's spot near the creek. The morning light and reflections on the water were too good to pass up so we took many pictures as the trail meandered along the lake. Macro and I stopped at Sula's spot on the shore to wish her one last farewell, until the next time we are in the area. From Fontanillis we made a steady climb to Dicks Pass, which at 9400' is the new highest point we've reached on the PCT and from here we enjoyed views towards the many lakes of southern Desolation Wilderness along with the string of peaks starting with Pyramid Peak rising above distant Lake Aloha, over to nearby Mount Price, and around to Jacks Peak just beyond Dicks Peak. Looking back we could see all the way to Needle Peak and Granite Chief, marking just how far we have come in the past few days. We visually charted our course past Susie and Heather Lakes then up to the shelf holding enormous island-dotted Lake Aloha, then put away the map and started down the trail. Just beyond the saddle, we saw a small stand of low and windswept Whitebark pine, the first time we have seen this species of tree whose range is limited to the high elevations of the Sierra Nevada. It was just another reminder that we are truly making progress towards the high country. Each lake we passed was a gorgeous deep blue, ringed by granite and ancient gnarled Western Juniper. We continued to see large swaths of heather, much of it still in bloom. We had a nice long lunch break on the shore of Lake Aloha under the watchful eye of some tall, twisted Lodgepole pine and dipped our feet in the refreshingly cold water. From Lake Aloha we had to stop lollygagging as Becky and Annika were scheduled to meet us at the trailhead in the mid-afternoon. We were deep in conversation as we finally reached the end of the enormous lake, and I was surprised that we hadn't started climbing yet. I checked the phone app to determine our distance to the next trail junction only to find that we were apparently no longer on the PCT. Oops. We had only gone ~0.4 miles past our turn so it didn't take long to retrace our steps, and Macro told Bryan that now he had gotten the full thru-hiker experience...bonus miles. Fortunately we had cell service as we climbed higher, so we were able to let Becky know we'd be a bit late. The afternoon got hotter and much of the last few miles were over exposed rock with just a few Lodgepole pine and Western juniper for strips of shade. We had brief views of several nearby lakes, and walked high above the shore of long, deep green Lower Echo Lake before dropping down and crossing the dam to reach the trailhead. Nearly 3-year old Annika was elated to see her dad, and I'm sure Becky was just as glad. We told her that Bryan's backpack included chopsticks, due to Annika's help in packing, and Becky confirmed that his missing trail mix was with Annika's toys. After a brief greeting Annika took Bryan's hiking pole and rode it around the parking lot like a horse while we organized up our next resupply from the back of their car. We had a great time hiking with Bryan and were sad to see him go, and it was hugs and waves all around as they got ready to drive home and we continued up the trail to Hwy 50. We'll stay tonight in a cabin generously offered by other friends, and hit the trail dark and early tomorrow headed towards our next resupply at Sonora Pass. The forecast is for clear weather over at least the next week and we are elated to be heading deeper into our home range.